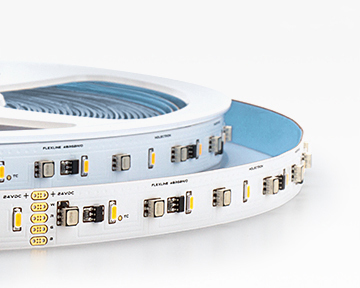 RGBW-48-9/O2 flexible RGB+White LED strips contain 48 RGB LEDs and 48 white OSRAM LEDs per single meter and use a power of 9.2 W/m. These RGB+White OSRAM LED tapes are designed for long-term professional colorful linear lighting applications and perfectly suit for decorative lighting, cove lighting, curved applications, edge lighting or furniture illumination. 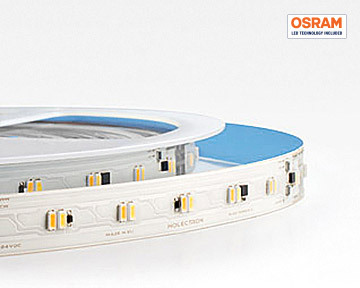 To produce our bendable RGBW LED strips we use OSRAM LEDs from Germany, thick copper PCB and IC drivers to stabilize current flow inside it. A special thermal conductive adhesive tape on the back side guarantees perfect heat transfer to the mounting surface. All of these features guarantee extra long lifetime and stable performance. White colored LEDs covers 2200K-6500K color range and have a high color rendering index (CRI) rate which is Ra80+ or Ra90+. It guarantees high lighting quality level. 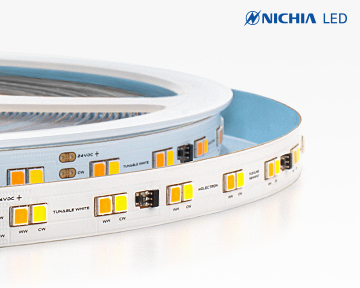 These flexible RGB+White LED strips are available with 3 STEP MacAdam or Single Bin white color LEDs. Luminous flux values of RED color is 54 lm/m, GREEN 159 lm/m and BLUE 33 lm/m. 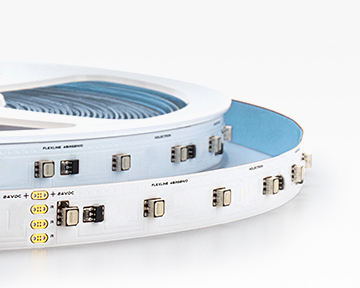 RGBW-48-9/O2 flexible LED strips available in any other color temperatures upon request.